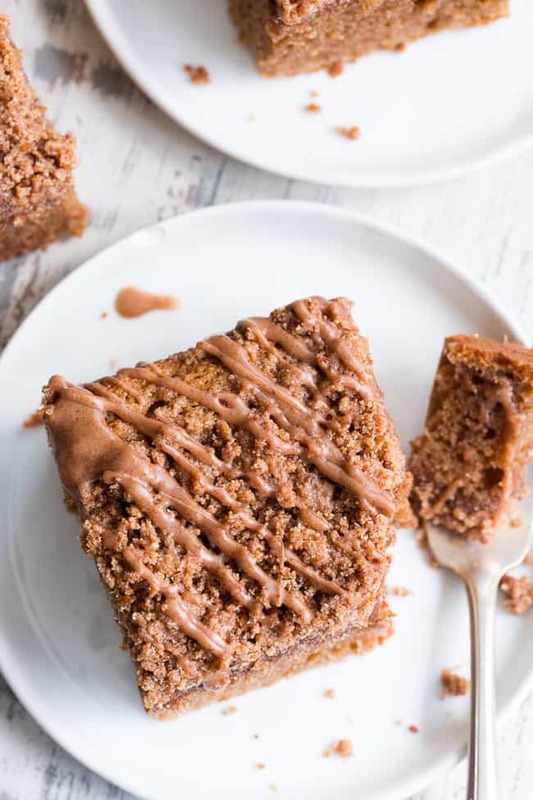 This classic cinnamon coffee cake has it all – a deliciously light, sweet, moist cake topped with loads of cinnamon crumbs and even an optional cinnamon icing! It’s paleo, gluten-free, dairy-free, kid approved and perfect for brunches, snacks and dessert. I think it was last weekend that I realized I didn’t have a good old cinnamon coffee cake recipe on the blog. How is that possible?! After all, it’s no secret I’m a big fan of a good crumb topping! 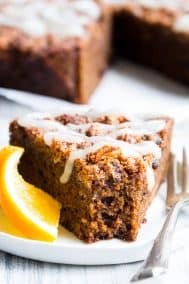 I think my issue is that I tend to reject the basic when it comes to baking – so trying out a cranberry orange coffee cake, caramel apple, orange gingerbread coffee cake or lemon crumb cake with lemon curd seems more appealing than a cinnamon coffee cake. 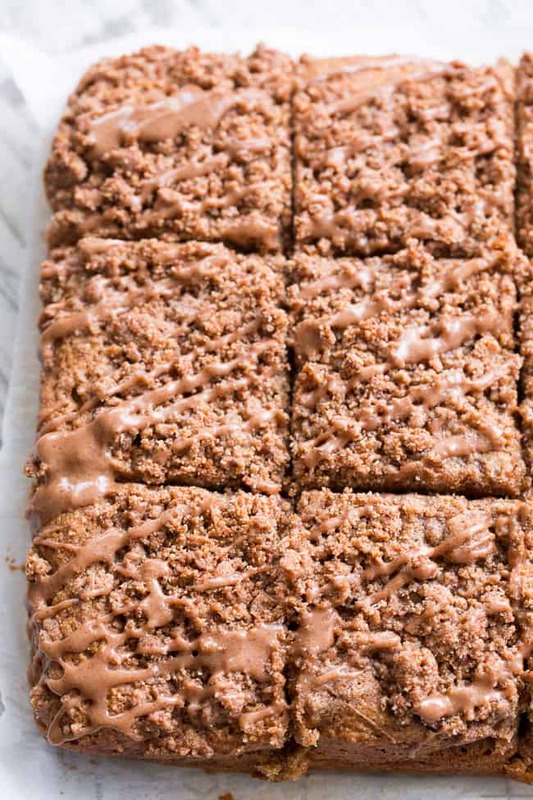 Now I would say the cinnamon crumb topping of any coffee cake is what makes it special – hands down. 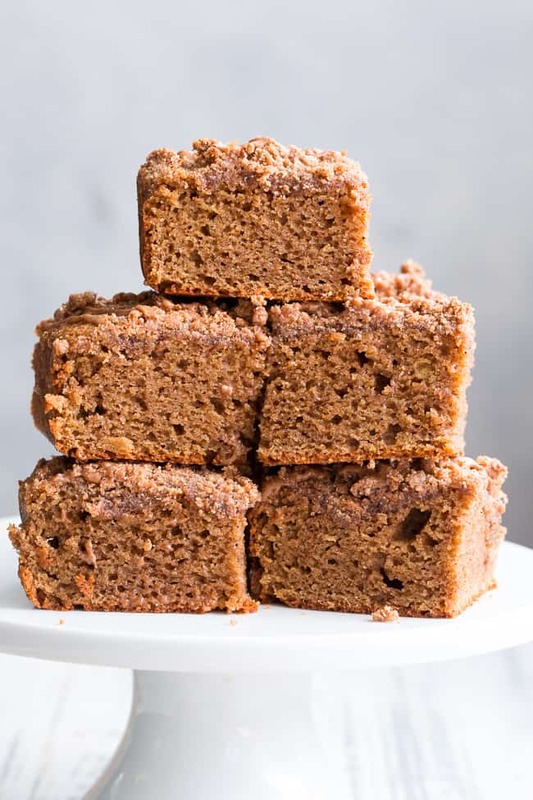 However, that doesn’t mean that I don’t pay attention to the “cake” part too – in fact – for all my coffee cakes, the cake-part is really spectacular, as in, unsuspecting family members wouldn’t guess they’re eating a gluten free (let alone paleo) cake. The texture is light yet moist, and the flavor has a slight nuttiness to it thanks to the almond flour. You don’t taste the coconut flavors AT ALL – especially if you use an organic refined coconut oil as I do. I only say this now because many people believe that coconut milk, sugar, and oil will make their baked goods taste like coconut – and it simply doesn’t work this way, luckily! However you’d be surprised to know that it’s pretty tough to make things taste like coconut – trust me – I sometimes try, on-purpose, and don’t get enough of a coconut flavor. 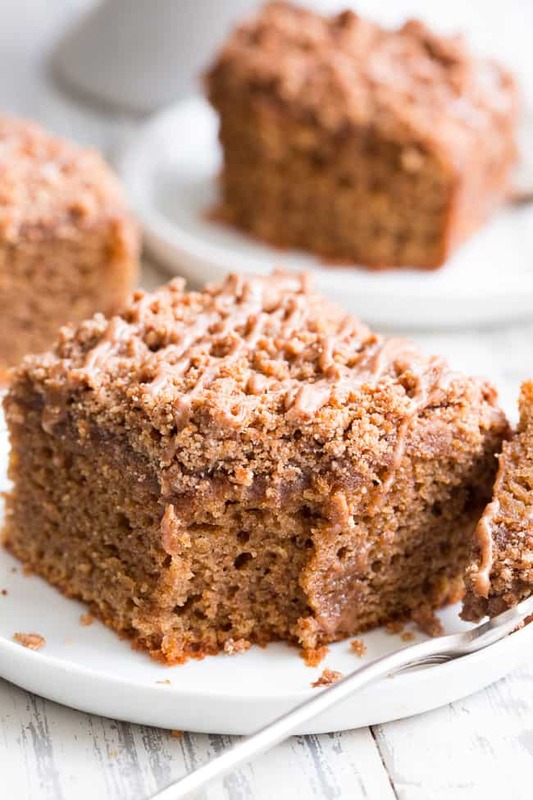 So, rest assured that this coffee cake won’t taste like coconut. It does however, taste like cinnamon – but I guess that’s probably why you’re here to begin with. Lastly, I’ll mention the icing. It’s totally optional, but if you want something a bit more special I highly recommend it! I made my own paleo powdered sugar for this one with maple sugar + arrowroot using my food processor – which is surprisingly easy and works with either a food processor or blender. Once you have a nice powdery consistency, you simply mix it with coconut milk, cinnamon, and vanilla for a nice drippy classic icing! Of course, if you’re not all about making your own powdered sugar, store bought organic powdered sugar will also work. I just wanted to give you a fun paleo-friendly icing option if you’re up for it! I think we’re ready to get going – get that oven preheated and let’s bake! 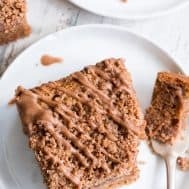 This classic cinnamon coffee cake has it all - a deliciously light, sweet, moist cake topped with loads of cinnamon crumbs and even an optional cinnamon icing! It's paleo, gluten-free, dairy-free, kid approved and perfect for brunches, snacks and dessert. Preheat your oven to 350 degrees and line an 8x8” square cake pan with parchment paper along the bottom and sides. Place all ingredients in a bowl and combine using a fork or pastry blender until a coarse crumbly mixture forms. Place in the fridge until ready to use. In a medium bowl, combine the almond flour, arrowroot, baking soda, salt and cinnamon, set aside. In a separate large bowl, whisk together the eggs, coconut milk, lemon juice, sugar(s), coconut oil and vanilla until very smooth. Stir the dry ingredients into the wet using a spoon or spatula until well combined. Transfer batter to the prepared cake pan scraping the sides of the bowl to get it all - the batter will be somewhat thick. Spread it out evenly in the pan, then sprinkle the crumb topping all over evenly. Allow cake to cool on a wire rack about 20 mins, then drizzle with cinnamon icing if desired (see Below). This cake is best served still slightly warm. 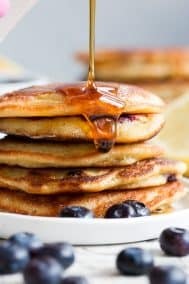 First, you’ll make paleo powdered sugar using the maple sugar and arrowroot* - place both ingredients in a food processor (a high speed blender should work too) and process until powdery smooth. Stir cinnamon and coconut milk into the powdered sugar, starting with 3 tsp milk and adding a bit more as needed to get the right consistency. Drizzle over cake as desired. Enjoy! This cake is best stored loosely covered at room temperature during the first 24 hours, and covered in the refrigerator after that. *If you don’t want to make your own powdered sugar, you can use 1/3 cup store bought organic powdered sugar in place of the maple sugar and arrowroot. this looks amazing!! do you think it would work with chia eggs in place of regular? I don’t think the texture would be right, more than two eggs means it’s tough to replace them. Is maple sugar safe for diabetics? Is there a suggested alternative? Also, my cake textures do not turn out like yours. Is this because I do not use a handmixer? I’m not sure why the texture is different. As for the maple sugar, if you’re unsure I’d sub in another granulated sweetener that would work for you. Hi! On the cake ingredients it says 1/3 maple sugar and 1/3 coconut sugar. 1/3 what? Cup, Tbs, tsp. This really looks good. I can’t wait to try it! Thank you! I’m gonna make this I hope this week! I love cinnamon too much not to!? Is there a replacement for arrowroot? Are we sure about the nutrition information? The amount of sugar in the recipe does match the nutrition info. Hi – I just updated the nutrition info which was slightly off for some reason – I also added a note that it was calculated without the optional icing. This cake looks so delicious! I love how fluffy the texture is – YUM! Hi there – I’m allergic to almonds ? Could I do a combo of coconut flour and cassava flour? Hi! I’m really not sure of the measurements for that, you might want to look at my blueberry coffee cake muffins which are nut free, for guidance! Just made these. Family approved! Very tasty and easy to make. Thank you foe sharing. Can I use double coconut sugar if I don’t have maple sugar? This is absolutely divine! Thank you very much for sharing such delicious and delightful treat. My husband baked this for me on our anniversary and I must say did NOT disappoint! He was amazed how you created the powdered sugar… I was amazed that I could drizzle as much icing as desired ? thanks again. Can you use Coconut Milk Light for this recipe? Easy to make- all my kids loved it! This PRECISELY came out as the picture!!! 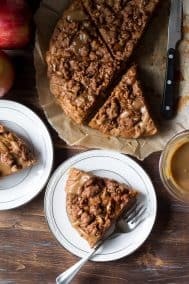 I have been paleo for the last year and one thing I missed TREMENDOUSLY was coffeecake. So as soon as I found this, I was all about it. YOU GUYS. ITS DELICIOUS. I made it without the icing only because I have a bit of a sensitivity to Coconut. So in the recipe I just substituted almond milk for coconut milk and it turned out great! It’s delicious! Moist and cinnamon-y! I added chopped pecans to the topping…we love nuts! My first paleo and gluten-free cake and I’m so impressed. Clearly a gateway drug… My kids (3 and 5) both loved it too! This recipe is true to outcome. I only made one alteration, I ised double coconut sugar instead of 1/3 coconut sugar and 1/3 maple sugar. Came out PERFECT! This is delicious. 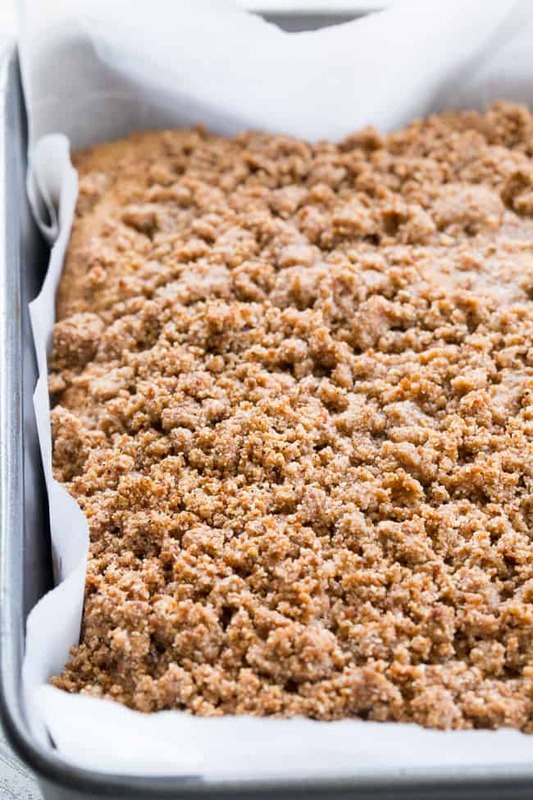 You won’t miss wheat-based coffee cake with this recipe in your arsenal. My entire family loves it (kid approved) loves it and I’m the only one who eats Paleo. Thanks! My crumble didn’t quite turn out crumbly. I had to roll it into balls to place on top, and after baking it’s just a little well of oil on top. Any suggestions? Hi! Make sure it’s chilled well to give it that crumbly consistency. You can sort of re-crumble it after chilling and before topping the cake. If that’s not working, use less oil next time. Do you think I could substitute cocoa powder for the arrowroot flour to make it a chocolate cinnamon cake? My baby is allergic to eggs (and dairy, and cashews, and pistachios 🤦🏻‍♀️) so they are off limit for us both while I’m nursing – any chance you think a few chia eggs could work in place of the eggs? Oh I just saw your reply about chia eggs above, NEvermind! Thank you for this wonderful recipe! I cannot wait to try it. I absolutely LOVED the lemon cake! So amazing! Could tapioca flour be used in place of arrowroot? 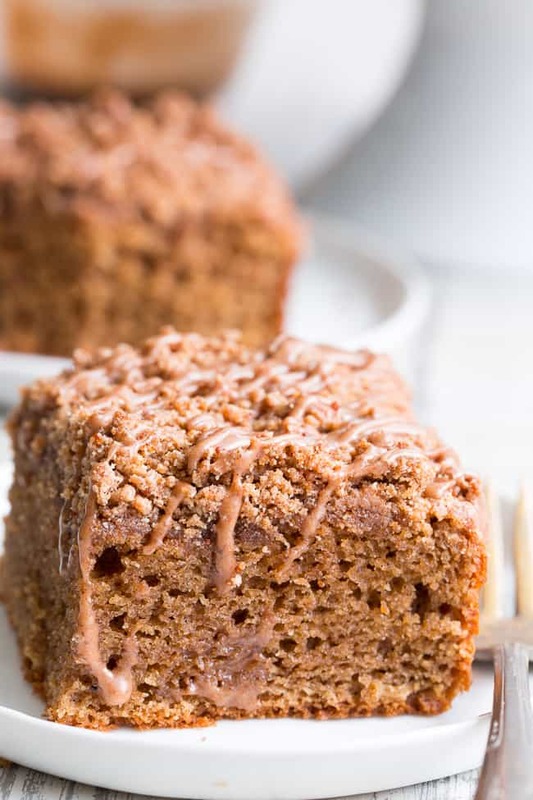 Coffee cake recipe! I have made it several times and it always turned out wonderful. The only change is I add chopped pecans to my topping.